John Edgar Tidwell is associate professor of English at the University of Kansas. All of his degrees are in English: Washburn University (AB, 1969), Creighton University (MA, 1971), and University of Minnesota (Ph.D., 1981). 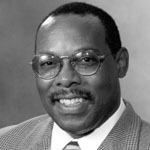 Among several honors, Dr. Tidwell served KU as the Langston Hughes Visiting Professor of English and of African and African American Studies (Spring 1994) and Johnson County Community College as Scholar-in-Residence (February 1999).